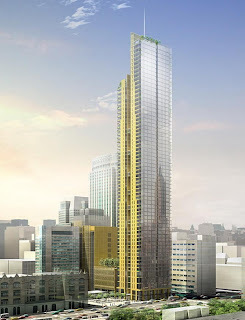 The 100-story tall Renzo Piano tower at Tillary and Jay Street that would have been developed by Bruce Ratner is dead. Both the Daily News and the Brooklyn Paper report the tower has fallen victim to rising costs and the credit crunch. Forest City Ratner would have built a dorm and lab for City Tech in return for $300 million and land to build the Piano tower, estimated at 70-100 stories tall. A CUNY exec told the Brooklyn Paper that it was a "was a mutual decision" and a statement said "timing and complexities" of development didn't match with the school's "immediate need." City Council Member David Yassky, however, blamed finances, saying Ratner "may be overextended right now." He added that "a lot of developers are re-evaluating their numbers and feel that residential buildings don’t work right now." CUNY will go ahead with building a new lab and dorm, probably in the range of 10 stories. Hope not. Brooklyn needs and wants Atlantic Yards!! Hope so. Brooklyn hates comic book characters. A closer reading will reveal that the building is not "DEAD". It will be Whittled" down and Renzo Piano has left the project. HOWEVER a building will be built. Smaller, less impressive, yes BUT a building will be built. GL has, and I am putting this politely, overstated the facts. Live in your fantasy land that Brooklyn will not be developed if you will, but you live in a dream.